Rogelio Armenteros does not have any MLB stats for the season. Full name is pronounced: roh-HELL-ee-o arm-enTAIR-ohs...Signed by the Astros as a non-drafted free agent on Sept. 15, 2014...signed by Astros scout Alex Jacobs...Is one of four Cuban players on the Astros 40-man roster...also IF Aledmys Díaz, IF Yuli Gurriel and LHP Cionel Pérez...Was added to the 40-man roster on Nov. 20, 2018.. invited to Major League Spring Training on Jan. 25, 2018. Spent the season at Triple A Fresno, going 8-1 with a 3.74 ERA (49ER/118IP) and 134 strikeouts in 22 games (21 starts)...had a strong finish, going 1-0 with a 3.25 ERA (13ER/36IP) and 45 strikeouts in seven games (6 starts) following the Triple A All-Star Break...started and finished a suspended game on June 3 at Albuquerque...his final line was 11 strikeouts on 147 pitches in an 8.0-inning complete game. Had arguably the best season of any Astros minor league pitcher in 2017 as he combined to go 10-4 with a 2.04 ERA (28ER/123.2IP) in 24 games (20 starts) between Triple A Fresno (10gs) and Double A Corpus Christi (14g/10gs), where he was a Texas League All-Star....combined to post 146 strikeouts in 123.2 innings pitched, while allowing a .205 opponent batting average...led all Astros minor league prospects in strikeouts and ranked second in wins...began the year at Double A making 14 appearances before a promotion to Triple A in July...in his first month at Triple A, earned the Astros Minor League Pitcher of the Month for July...made five starts for the Grizzlies that month and won all five of them...during the month, he led the Pacific Coast League in wins (5) while ranking tied for third in strikeouts (33) and eighth in ERA (2.86, 9ER/28.1IP). Combined to go 8-6 with a 3.53 ERA (50ER/127.2IP) in 26 games (22 starts) between three levels: Corpus Christi (3gs), Class A Lancaster (19g/16gs) and Class A Quad Cities (4g/3gs)...led all Astros minor leaguers in strikeouts with 140 in 127.1 innings pitched...moved up the Astros system in sequence, going from Quad Cities (Opening Day-April 23) to Lancaster (April 28-Aug. 16) to Corpus Christi (Aug. 21-end of season)...while with Lancaster, was named the JetHawks Pitcher of the Month in June after going 2-0 with a 1.48 ERA (4ER/24.1IP) and 30 strikeouts in five June outings...during the month, ranked second in the California League in ERA...also was named the California League Pitcher of the Week for the week of July 4-10...following the season, made eight appearances for Glendale in the Arizona Fall League. Made his stateside debut, posting a 3-2 record and a 3.69 ERA (25ER/61IP) in 15 games (12 starts) between Quad Cities (3gs) and Class A Tri-City (12g/9gs)...fanned 61 hitters in 61 innings pitched...spent most of his season with Tri-City before a promotion to Quad Cities for his final three starts of the year. 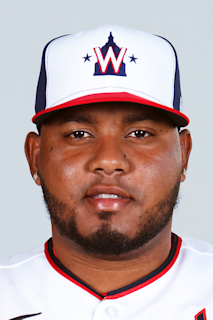 March 12, 2019 Houston Astros optioned RHP Rogelio Armenteros to Round Rock Express. November 20, 2018 Houston Astros selected the contract of RHP Rogelio Armenteros from Round Rock Express. November 13, 2018 Gigantes del Cibao placed RHP Rogelio Armenteros on the reserve list. October 13, 2018 RHP Rogelio Armenteros assigned to Gigantes del Cibao. July 6, 2018 Rogelio Armenteros roster status changed by Fresno Grizzlies. July 1, 2018 Fresno Grizzlies placed RHP Rogelio Armenteros on the temporarily inactive list. January 25, 2018 Houston Astros invited non-roster RHP Rogelio Armenteros to spring training. July 17, 2017 Fresno Grizzlies activated RHP Rogelio Armenteros from the temporarily inactive list. July 11, 2017 Fresno Grizzlies placed RHP Rogelio Armenteros on the temporarily inactive list. July 2, 2017 RHP Rogelio Armenteros assigned to Fresno Grizzlies from Corpus Christi Hooks. June 29, 2017 Corpus Christi Hooks placed RHP Rogelio Armenteros on the temporarily inactive list. June 18, 2017 Corpus Christi Hooks activated RHP Rogelio Armenteros from the temporarily inactive list. June 15, 2017 Corpus Christi Hooks placed RHP Rogelio Armenteros on the temporarily inactive list. May 1, 2017 RHP Rogelio Armenteros assigned to Corpus Christi Hooks from Tri-City ValleyCats. April 28, 2017 RHP Rogelio Armenteros assigned to Tri-City ValleyCats from Corpus Christi Hooks. March 2, 2017 RHP Rogelio Armenteros assigned to Houston Astros. October 9, 2016 RHP Rogelio Armenteros assigned to Glendale Desert Dogs. October 8, 2016 RHP Rogelio Armenteros assigned to Glendale Desert Dogs. August 9, 2016 Lancaster JetHawks activated RHP Rogelio Armenteros from the temporarily inactive list. August 5, 2016 Lancaster JetHawks placed RHP Rogelio Armenteros on the temporarily inactive list. June 13, 2016 Lancaster JetHawks activated RHP Rogelio Armenteros from the temporarily inactive list. June 9, 2016 Lancaster JetHawks placed RHP Rogelio Armenteros on the temporarily inactive list. April 25, 2016 RHP Rogelio Armenteros assigned to Lancaster JetHawks from Quad Cities River Bandits. August 25, 2015 RHP Rogelio Armenteros assigned to Quad Cities River Bandits from Tri-City ValleyCats. June 19, 2015 RHP Rogelio Armenteros assigned to Tri-City ValleyCats. September 15, 2014 Houston Astros signed free agent RHP Rogelio Armenteros to a minor league contract.